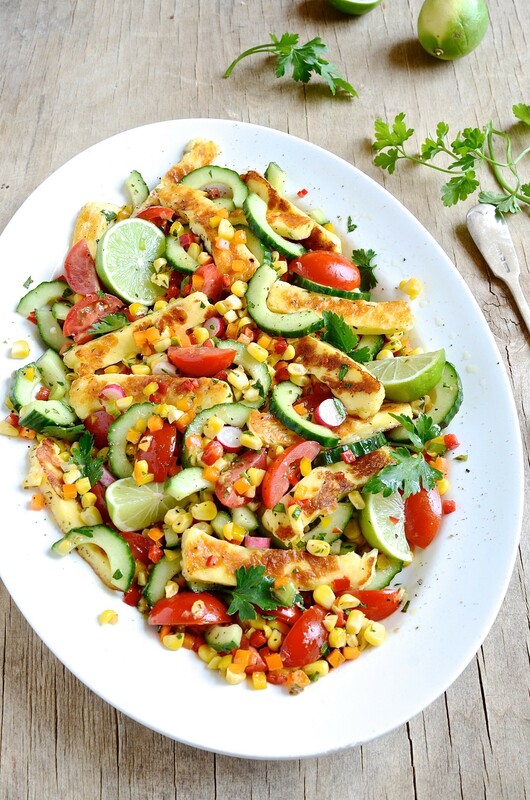 This roasted corn and halloumi salad is summer on a plate. 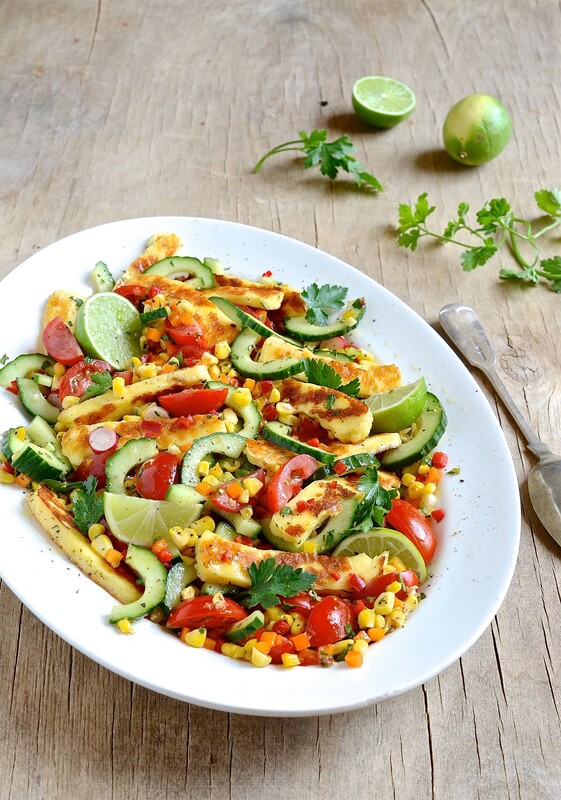 Jewel coloured sweet peppers with pan-roasted corn, cherry tomatoes, cucumber and chewy halloumi. Tossed in a minted chilli dressing, it’s vibrant and fresh, I’ll definitely be bringing this rainbow coloured salad to the table on Braai Day. The sweetcorn is pan-fried in cumin and paprika. The flavours are decidedly Mexican. To this I add a mixture of yellow, red and orange sweet peppers. You can throw in a green pepper if you like but they tend to be a little bitter, so I leave it out. Note: Cucumber is mostly water so remove the seeds to prevent the salad becoming watery. If you don’t, it’ll dilute the flavour. Let’s face it. There’s never enough halloumi so be sure to make more than you think you’ll need to prevent unnecessary family squabbling on Braai day. This is not a case of less is more. More is more, so just keep that cheese coming. A generous spritz of lemon or lime juice on fried halloumi is essential. For additional crunch and texture I’ve thrown in a few thinly sliced pink radishes and spring onions. Delicious! A great salad dressing is as important as using the freshest produce. Olive oil and lemons are my two kitchen staples. Serve this halloumi salad with this paprika spiced roast chicken or a juicy rib-eyed steak. Quick side note: Dress and toss the halloumi salad just before serving to avoid it becoming watery. Heat the olive oil in a pan and add the corn. Season with cumin and paprika and fry on a high heat for several minutes, tossing the corn over all the while. The corn should still be crunchy and with a firm bite. Season with salt and freshly ground black pepper. Set aside to cool. Slice the cucumber into half moon shapes. Dice the peppers into small jewel-like cubes. Place the cucumber, peppers, tomatoes, radishes, spring onions, chilli and herbs in a large mixing bowl. Once the corn has cooled to room temperature, add to the salad. Heat a drop of olive oil in a non-stick frying pan. Cook the halloumi for about a minute on both sides until golden brown. Season lightly with salt a spritz of fresh lemon juice. To finish, season the salad with salt and pepper, drizzle with the 2 tablespoons lemon juice and olive oil. Toss together. Transfer the salad to a serving platter and top with the halloumi. This looks like summer on a plate!!! I cannot wait to try it! Think we need to braai tonight 😉 Thanks Di! It is a beautiful salad – I love halloumi; this sounds perfect! It’s definitely going to be a regular on my summer table. Super-fresh salad, with lots of crunch! Enjoy Braai Day! Thanks Zirkie. Each time I make halloumi, I wonder why I don’t have it more often! Ooh, Di!! This looks so fresh and delicious. Also a bit different yet easy to make. I’d better plant more radishes! A real summertime salad Tippy. The radishes add great texture and crunch. So fresh and crunchy. Really good with barbecue meats.